I’m always looking for ways to save space in my garden, and one of the easiest ways to save space is to plant things so that they grow up instead of out. Pole beans are a good example of this. Since they grow up instead of out, you can get a lot more production in the same square footage than you would by planting bush beans on the ground. The problem is, pole beans are a pain; not the beans themselves, but the poles. Cutting poles and sticking them in the ground is pretty labor intensive, so I’ve tried several different methods of planting pole beans so try and cut down on the labor involved. I tried the pole with strings running to the ground to form bean teepees. A lot of work, and I could have bought the beans for what I spent on string. 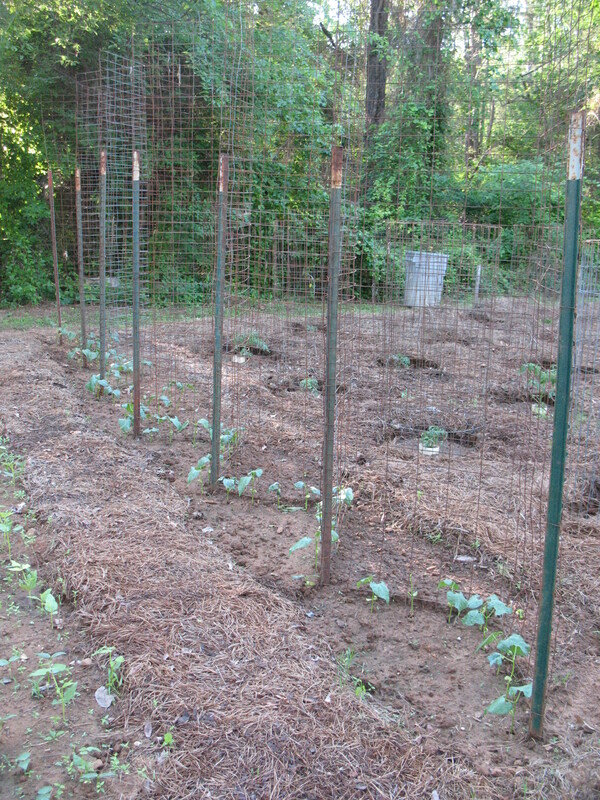 I tried setting up a welded wire fence for the beans to grow on. 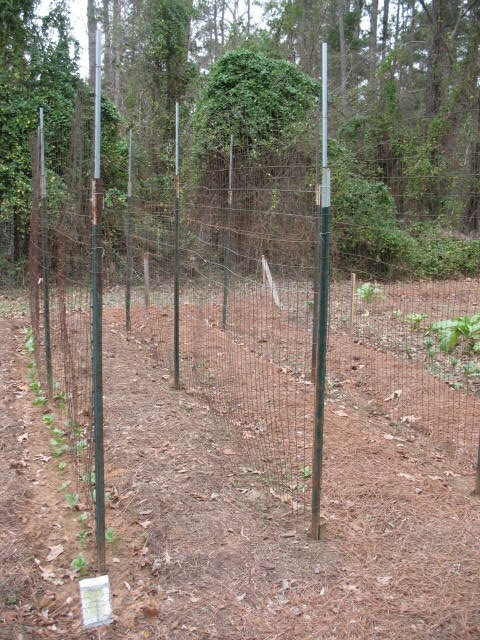 The problem is that most fencing is only four or five feet tall, and pole beans grow a lot taller than that. So I came up with a new idea that I’m trying this year. 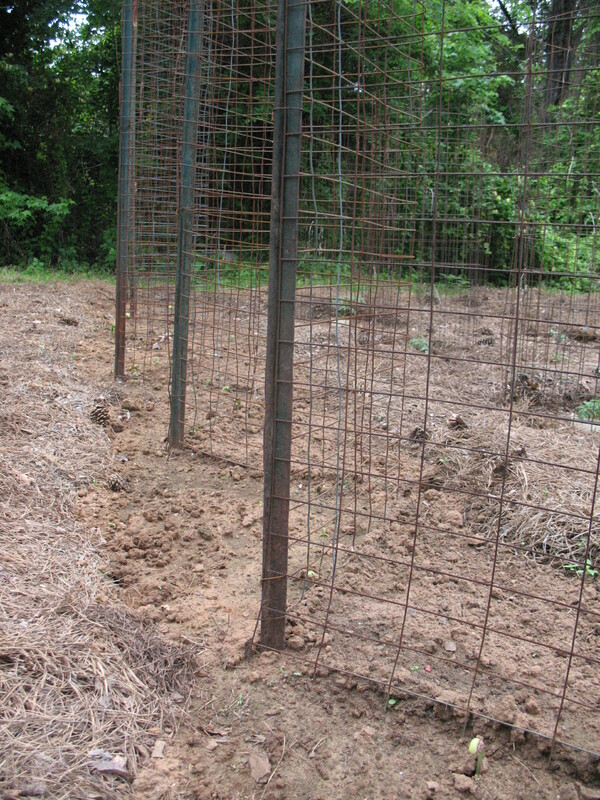 I asked myself, “How can I get a taller fence without having to extend the fence posts and piece the fencing together?” Well, I thought, I could cut seven feet of fencing and then turn it up and down instead of sideways. Good idea, but the fencing is very flexible and wouldn’t stand up straight unless I had seven foot tall posts. Seven foot T-posts cost about $3.50 each and I needed seven of them. I can’t see the logic in spending $25 to grow $10 worth of beans, especially when I have a whole pile of old five-foot T-posts that I could use. Then I had a minor brain-storm. What if I bent the fencing down the middle at about a sixty degree angle? 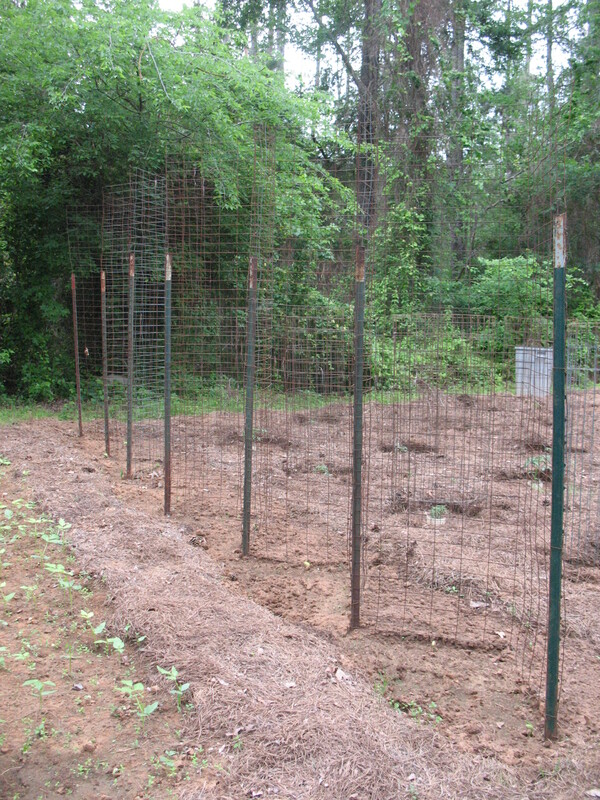 This would keep the fence rigid, and because of the zigzag course of the fence I would get more feet of fence into the same length of garden row. Or you could try planting them with corn. That way they’ll climb up the stalks as they grow and you won´t have to deal with poles at all. Hank, if you want “green” beans do not try the corn method. The Indians planted this way to harvest “dried” beans. Years ago I made the mistake of planting pole beans in a corn patch. The beans grew up the corn just fine, until I tried to pick it. Ever tried to pick beans every three days in a corn patch? That year the raccoons knocked down the beans to get the corn. Your blog is very interesting. Lots of good projects to explore. How did the zig-zag work out for you? Sounds like a good idea and considering working it into my garden.